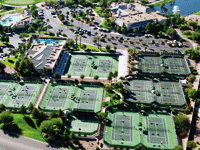 The IronOaks Tennis Club is located in the beautiful IronOaks community in Sun Lakes, Arizona. The club has fourteen tennis courts; ten hard surface courts and two Har-Tru clay courts. The IronOaks club is home to many USTA national and sectional championship teams and the club often hosts USTA Tournaments. Membership in the IronOaks Tennis Club is available to all residents of the IronOaks community. In addition, a limited number of non-resident memberships are available. There is an annual membership fee for those who wish to have full privileges. All residents and their guests may use the facility with some restrictions. Members have the advantage of being able to request court reservations using an on-line reservation system. The on-line system assigns courts 3 days prior to play and then notifies the players of their court time and court number. Members also enjoy social events, tournaments and other club activities as well as access to the sauna, lap pool, lockers, shower and whirlpool. 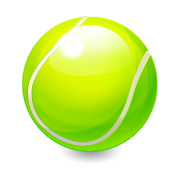 Click on the tennis ball below to continue into the web site and learn more about the club.